An intraocular lens implant is usually placed in the eye after cataract surgery and may occasionally become malpositioned or dislocated. This may occur as the result of trauma at the time of surgery, previous trauma to the eye that damaged the natural lens or becasue of a systemic disease. Vision may be blurry, double and reduced to the point of legal blindess. Most cases can be readily treated with surgery. A dislocated IOL can be identified by examining the front of the eye with a microscope (slit lamp biomicroscopy) as well as the back of the eye using other lenses for viewing the retina. The lens may be falling down from its normal position (sunset syndrome) or completed displaced into the back of the eye. Signs of a dislocated intraocular lens (IOL) are the following: the absence of the lens when examining the front part of the eye, viewing the edge of the lens in the slit lamp or seeing the lens at the back of the eye. The patient may notice the edge of the lens implant or even have double vision. If the lens implant dislocates entirely out of the visual axis, the patient may have a very substantial drop in visual acuity, usually to the “counting fingers” level. Patients at increased risk for a dislocated IOL may have a medical condition such as pseudoexfoliation, Marfan’s Syndrome or homocystinuria. In each of these cases the fibers that hold the natural lens in place are defective due to to an abnormal protein made by the body. Fibers that contain the protein normally hold the lens in place. In some cases these preexisting conditions may not be diagnosed. Trauma is also a risk factor and cataracts that develop after trauma should be managed more carefully. Finally, the natural lens of the eye includes a very thin capsule that can break during surgery, even in the best of hands. If the lens is not well supported by the capsule it also might also dislocate. 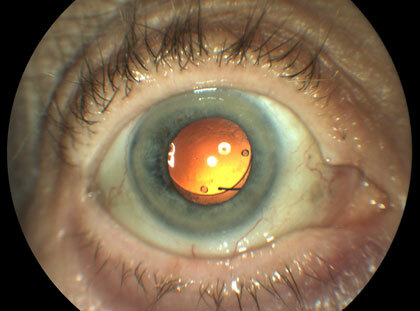 Dislocated IOL is treated by moving the lens into the correct position, replaceing the lens or sewing a lens in place. In most cases the gel in the back of the eye, or vitreous, must be removed in part through the surgical process called “vitrectomy”. Once the lens is free of the vitreous gel it can be moved more safely and repositioned or replaced. In some cases a new lens can also be sewn into the back of the eye.